Peter has 25 years of highly successful experience as an accomplished senior C-Suite executive in sports administration with some of Australia’s most iconic sports and entertainment brands where he has been the strategic, commercial and marketing lead across a variety of sports business environments. Peter has developed a reputation as a business transformation specialist and a strong strategic and commercial leader with a collaborative and outcome focused approach to business. Peter’s current role is Chief Executive Officer of Football Victoria (FV) overseeing the state’s 350,000 strong organised participation base across both Men, Women, Boys and Girls of all abilities across over 340 clubs. 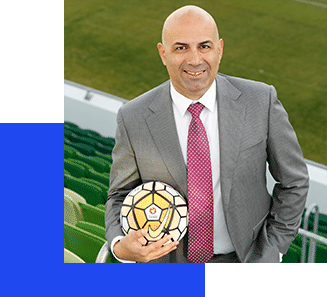 Prior to joining FV, Peter had a successful three (3) years as Chief Executive Officer at the Perth Glory Football Club, leading the club out of the salary cap saga that plagued them in 2014/15 Hyundai A-League season. In this role, Peter played a critical role in the business transformation of the club and developing and implementing a new strategic plan, The Perth Glory Way, driving the club in a new and exciting direction which lead to significant improvements in the club’s operations and commercial achievements (including a 40% increase in Membership, 20% increase in revenue and 33% improvement to the bottom line). During his term, Perth Glory was also accredited as an FFA two-star academy incorporating a development pathway from 12 years of age upwards and also moved into a word class training and administration base in Floreat. Peter has developed a strong reputation as a senior sports and entertainment executive with a demonstrable history of major accomplishments in all his roles as the strategic, marketing and commercial lead across a variety of Australian iconic high-performance sports brands. This includes eight (8) years with AFL clubs Hawthorn Football Club and North Melbourne Football Club, seven (7) years with the world-class Etihad Stadium located in Melbourne and 18 months National Sporting Organisation, Swimming Australia (Australian Dolphins Swim Team). Peter is a proud Australian, born and raised in Melbourne and is married to Mary, who is a Marketing Director with a global technology organisation and has two children, George 22 years of age and Jonathan 11 years of age.